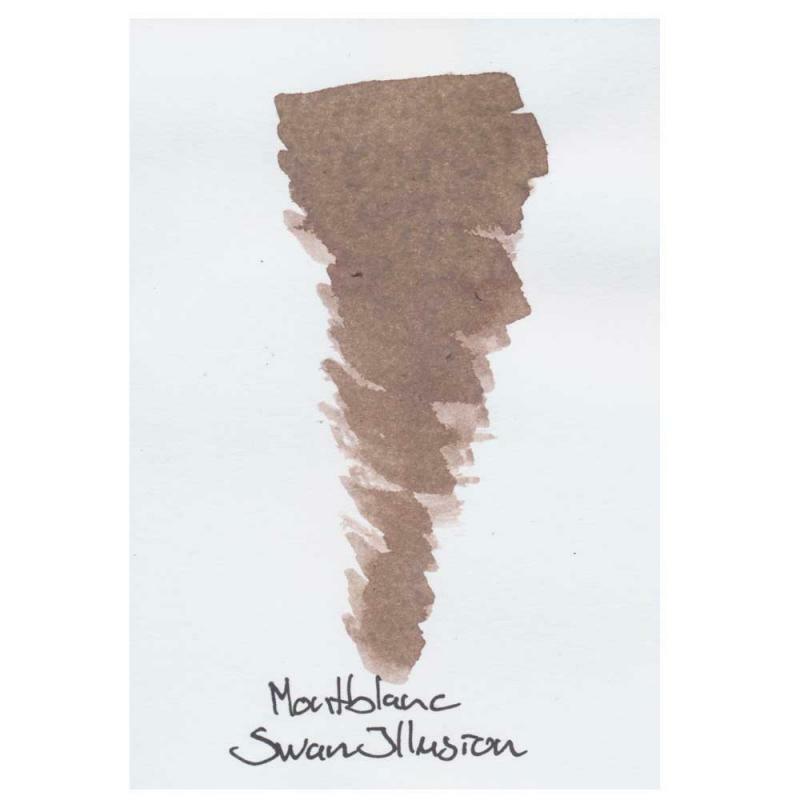 The new Montblanc Swan Illusion Plume ink bottles have arrived and we are trying to put a name to this color. Is it brown, grey, ocre, sepia? As we have not reached a conclusion we just do not name the color of this ink. 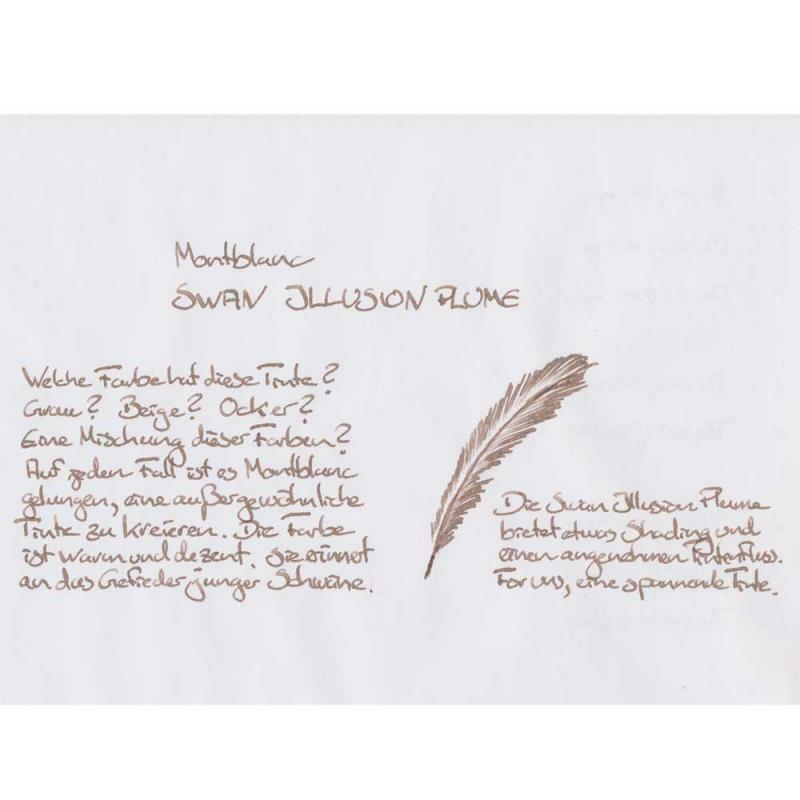 The Swan Illusion Plume ink has a warm and discreet color. Shading is minimal and the ink flow good. € 35.- at our shop. Thank you for the first sample I have seen for this ink. I can see the uncertainty for it's color family & applaud your description as "warm & discreet;" without general experience with young swans I cannot say I see the relationship but I suspect it is assuredly Montblanc's intent to offer a swan relationship with this ink. I think persons who sketch or draw with ink will best find it's uses. What an unusual color. Appealing, but unusual. I don’t want to like it but for some reason I do. It does look somewhat like the feathers of cygnets, although the colour of the ones near here is slightly more grey. I like it! Soothing to the eyes when writing more than a few pages. Nice concise analysis, Jack. This is a subtle ink. If we can have Brown/Pink then surely we can have Beige/Pink or Pink/Beige maybe? I'm still on the fence about this one. How about "dove grey"? Or "French grey"? It reminds me of a Prismascolor pencil I used to have 45 years ago. Ahh... I dunno... sorta like a mix outta flesh and barf.... Whatever... I do like it because it really is unique. I don't have any MB, but I have to reply. Dead grass in Texas is a much lighter brown, very close to beige. As in one spark and it becomes yellow, green and blue and creates a lot of smoke! We have our share of grass fires. Barf, upchuck, or spew, BTW, had more than one color. That's why some call it the "Technicolor yawn." Here is what I do see. Brown crayon or coloring pencil from school days. I also see my tan, after the sunburn, before it peels. Very fair skin here, you can't tell the difference between my socks and my legs, they haven't seen the light of day during my life, but for few exceptions. Swimming, that's about it. Not even when I was a kid. I wear blue jeans year round. Crayon Brown though. How about Swan Illusion Plume though? I also thought of mushroom. For some reason I feel 35Euros in my pocket begging to be exchanged for a bottle, but how much is in a name? If it were called "Cardboard Box from Amazon" would it still be so attractive? how much is in a name? I don't know. It's a strange name, like three randomly selected words. The color just looks like cardboard to me, too. It's one of those things that I didn't think of but, now that I have heard, cannot think of anything else when I see it. Thankfully it doesn't look like cardboard when you write with it. For me, it's one of the better Montblanc inks. It took me a while to get it but now that I have it I'm very pleased with it. It's somewhat watery which may not suit some, but is a pale - but pefectly legible - sepia that's actually well named and more complex a colour than online pictures do justice.